Being able to obtain and produce clean water is the first step in physical independence. In an ideal situation, you have access to free, natural sources of fresh water that require very little cleaning if any, such as glacial streams. This is not going to be likely for most people, so you will have to be able to clean your water. As a transition step, you should get your hands on a 2 stage water filter with as many replacement filters as you can afford. The kind of filters I’m talking about include a ceramic and carbon stage, such as the ones produced by Doulton or Katadyn. In the long term, your goal should be to find and frequent locations that have natural sources of uncontaminated water which you can render safe with a basic filter you can make yourself, like the one I am about to describe. This basic earth filter will clean out microbes and viruses so that you can drink safely. Two 4-5 gallon pails or containers with lids, such as a clean plastic paint drums you can get at the hardware store. Long green grass (the kind you used to run through or pluck and chew on as a kid). If you can’t find long grass, a substitute might be natural (non toxic) hemp rope. Finally, you will need some black charcoal from burned wood (if there’s still some unburned wood in there, that’s ok). Don’t use barbeque charcoal or any other burning charcoal that has been treated with anything, or you will be poisoning yourself. If you’ve done any practicing, you will have learned how to camp and build fires by now, so you should have access to all the burnt wood charcoal you need. Fill 1/3 of the drum with lava rock. Cover this with a layer of plastic screen. 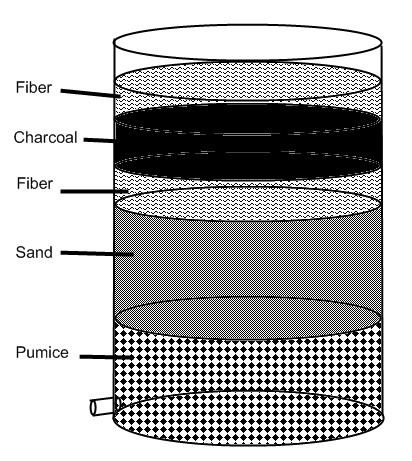 Fill the next 1/3 of the drum with clean sand. Cover this layer with another layer of screen. The final 1/3 should consist of a layer of the long grass, a substantial layer of the charcoal, and then a final layer of long grass on top of that. Twist and coil bunches of the grass to arrange even layers, and make sure your charcoal is well distributed and solid – its very important that there are no gaps or holes in this layer. Add a layer of the screen on top of the grass/charcoal layers. Don’t attach your lid yet – perforate it with 6-8 evenly spaced holes, and use it in the next stage. 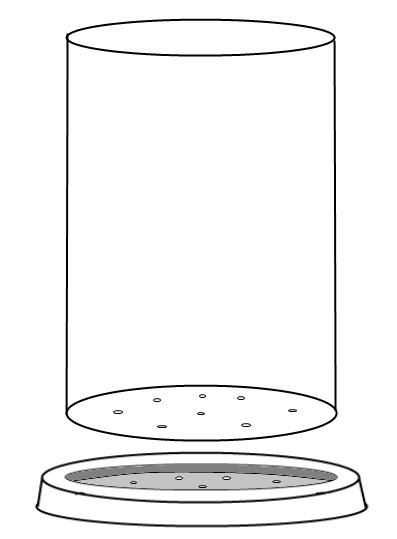 Perforate the bottom of the 2nd barrel with 6-8 evenly spaced holes. Put something heavy inside the barrel so there is even pressure bearing down on the lid, and apply another line of silicone/caulking around the outside edge of the bottom of the barrel, where it meets the lid. Now you should have a well-sealed connection. Let these dry thoroughly. When dry and firm, attach the upper section/lid onto the top of your 1st barrel, and take it somewhere where you can run some water through it to clear out the initial debris. Pour 4-10 gallons through this filter (slowly) and let run out the drain at the bottom. The initial volume of water will carry out much of the loose particles and dust from your sand and pumice. For a while after this initial cleaning, some of these particles may continue to appear at the bottom of your glass to some degree, but they are not harmful. Water is poured into the top bucket (the reservoir) and slowly trickles through the holes and into the filter bucket. Although it is portable, be careful not to carry it by the top bucket, as you could tear the silicone seal. 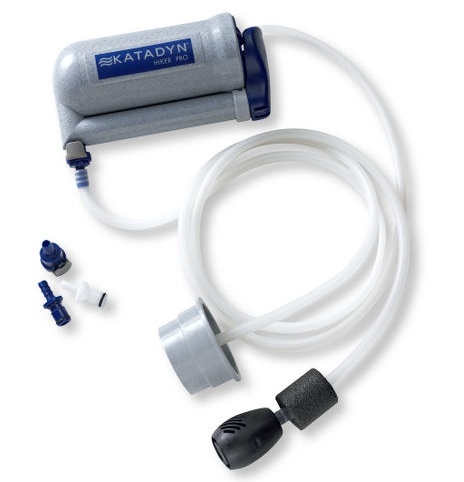 Although this is not a top of the line water filter, it is inexpensive to make and easy to put together. It will last for years, and provide clean water for drinking, cooking, and washing. The key operating element here is the charcoal, so bear in mind that you may not catch chemicals and heavy metals with this. Its main value is keeping out parasites and diseases.